Do dehydrators need to rest? I sure hope not--mine's been going since Friday afternoon, and won't get a break until tomorrow evening. I would hope that they're built for this kind of use...right? What can I say--I like to play with new toys! Things will probably calm down...eventually...maybe. At the farmer's market on Saturday I bought blueberries and pineapple, thinking they might be nice to dry and eat as a snack, or over cereal. Arthur is working on them at the moment, though I doubt they'll be done much before tomorrow afternoon, since there is so much juice in both. I've never had dried blueberries before, and I'm very intrigued. I've had died pineapple lots of times, but I suspect it was with added sugar. I'm looking forward to what dried pineapple really tastes like. And they're both dried the "raw foodist" way so they'll retain the vast majority of their nutrients and enzymes. I'm also making raw granola. Yes, from a recipe. It looked amazing spread out on the teflex sheet, and smelled even better. I find the problem with commercially-produced granola is that the people who make it seem to have lost sight of why most people want to eat granola--because it's healthy. But they end up adding so much nonsense to it, that it loses all resemblance to the original items. Commercial granola often is upwards of 300 calories (and Lord knows how much fat and sugar!) or 1/2 a cup! What the heck have they done to it?? And as importantly WHY??? It's disgusting and so unnecessary. Which is why I'm all geeked-out over the idea of raw granola actually being good for me. Process the almonds in a food processor fitted with the "S" blade into small chunks and transfer to a mixing bowl. 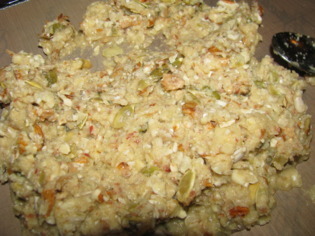 Process the pumpkin seeds and sunflower seeds until roughly ground and combine with the almonds. Process the apples and add them to the nuts and seeds. Add the cinnamon and sea salt and mix well. Spread the mixture onto a lined dehydrator tray and dehydrate for 20 to 24 hours at 105F or to a desired crunchiness. Be sure to dehydrate until all the water is removed from the granola. Add 1/2 cup raisins to the granola after dehydrating (if using). Store in a glass air-tight jar. This granola will last up to 3 months, so make lots! I'll take a pic tomorrow evening if it's done, so you can see how it turned out. I did a half-recipe amount, because I want to try it out, before going to the expense of making a quadruple recipe! I have a feeling it's going to be marvy though, just based on the aroma when I was mixing it. If it turns out well, I'll make a super-batch for sure. The half-recipe filled one tray, allowing for it to be spread out in lumps here and there, rather than in one big thick sheet. I'm assuming that's how it's supposed to be spread out...I would think that one thick sheet would be VERY hard to dry, but I may be wrong, especially since a lot of the mixture is apple, which will dry down to a much smaller size. Doesn't really matter much with this batch anyway. Next batch I'll experiment--maybe do a double batch, and see if I can get it all on 2 teflex sheets (that's how many I have at the moment). You really can't go too wrong with dehydrating, particularly the things that need to be completely dried, like this granola does. It's dry when it's dry, and it's not like it's going to burn! Lots of raw dishes don't require any pre-soaking or dehydrating, and those that do, it's important to remember that all it is, is planning. The 20 or so hours of dehydrating requires no work on my part at all. The prep was putting the nuts and seeds in the fridge to soak...almonds last night, pumpkin and sunflower seeds this morning. Then the recipe itself took just a few minutes. So all it is, is planning. I already learned to do that, when learning to eat cleanly. Eating good, nutritious food means cooking most of the time, not opening up a box and slipping it into the oven. Sometimes that's fine, as a treat, but for all the time, real food is the way to go. What it also means, is that I'm a lot more conscious and aware of what I'm eating, and what is going into it. And surprisingly, it's rather liberating! Knowing that everything (well...almost everything!) that I eat should contain no "food guilt" at all, because it's good for me, is truly an amazing experience. Fortunately I've never been a binge-eater (not with meals...but junk is another story), so I don't have to worry about eating too much healthy food. I can just eat lovely, delicious, fabulous-for-my-body foods, enjoy them immensely...and that's it!